A simple, easy and affordable serger . . . with room to grow. In just one pass, you can cut, sew and finish edges on everything from fine silks and satin to denim, fleece and stretchy fabrics with the greatest of ease. And, although the 800DL is an entry level machine, you can sew like a pro with versatile features that make serging fast and simple. Upper Looper Cover: The upper looper cover lets you serge with just 2 threads, allowing you, for example, to neaten individual layers of fabric, or to create decorative rolled hems with suitable fabrics, while saving thread in both cases. Differential Feed and Stitch Length Controls: These ergonomic, easily accessible controls let you adjust fabric feed and stitch length to perfection with the flick of a wrist – even in the middle of the serging process. 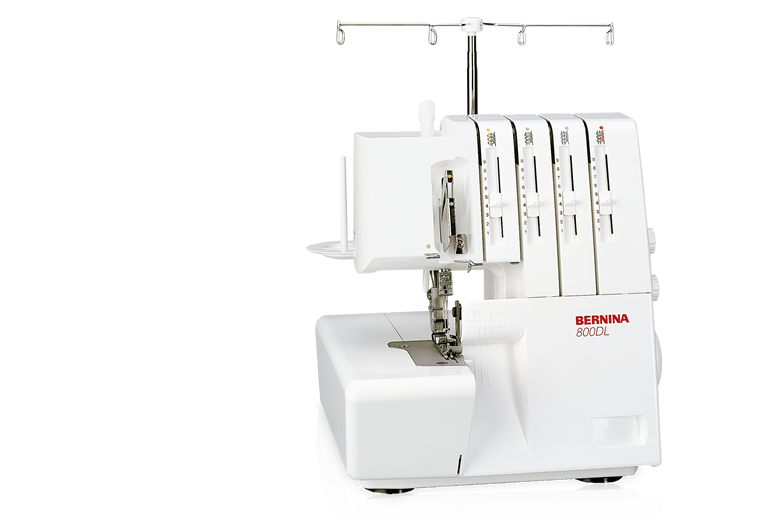 Threading (Lay-in) System: The BERNINA lay-in system lets you thread quickly and directly at all times. Thanks to the automatic lower-looper threading system, it’s also a cinch to thread the lower loopers.